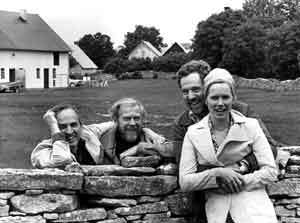 At age 89, on July 30, 2007, Ingmar Bergman left us. Tragically, he won’t be widely mourned by today’s movie audiences. His unblinking, introspective examination of the human condition places heavy demands on his viewers. His last film, “Saraband” (2002), was greeted respectfully as a curiosity from an 82-year-old director; it received only limited distribution. Audiences today find his characters narcissistic and his themes lugubrious. The observation has some merit. Bergman rarely turned his lens on the cheerier side of the human condition, but he never averted his eye from the truth as he saw it. He created films for adults, especially for adults who, he believed, were as serious as he was about making sense of their own humanity. More than any other single director, he established an uncontestable niche for cinema as a true art form. After Bergman, intellectuals no longer had to apologize for writing and thinking about films. Bergman’s legacy staggers the imagination. Looking over his filmography is like picking up a volume of Shakespeare’s complete works. One wonders how a person could create so much in one lifetime, and most of it extraordinary. In addition to the more than 50 films Bergman scripted and directed, he wrote for the stage, for radio and television; he authored novels and an autobiography; he taught theater and staged performances of classic plays and operas all over the world. Ever true to his own sense of the self, he remained in Sweden, confident that if he had something important enough to say, audiences would make the effort to overcome linguistic and cultural barriers to listen. He never needed Hollywood, the English language or international stars to ensure his success, since he defined success on his own terms, and these did not include huge box-office returns. In a flurry of obituary notices, he has been universally praised as one of the great artists of his time. I would like to add a note of appreciation for Bergman the theologian, or at least, Bergman the religious thinker. No doubt he would reject both terms. He uses images where theologians use words. He crafts dialogue where they construct concepts. He exposes the messiness of the human condition, where they seek clarity. He focuses on the struggling, solitary human figures reaching outward, where they begin their inquiry with a God reaching down, revealing himself. But looking at the films, one sees a congruity in their tasks. Bergman’s religious interests came naturally. His father, Erik, was a Lutheran pastor of the old school. One of his associates in Sweden described him to me as “dour.” Their relationship was less than cordial, but as a child Ingmar traveled with his father to country parishes, where he listened to the sermons and hymns and studied the icons and architecture to pass the time during services that seemed interminable to a restless young boy. His mother, Karin, was a difficult woman, and Ingmar grew up as a somewhat lonely child, who lost himself in his puppet theater and his primitive movie projector. University life in Stockholm provided the opportunity to react against his family upbringing. He studied literature, but also devoted himself to an amateur theater group. During the war years, he remained active in the Stockholm theater community and began working at Svensk Filmindustri, the national film production company. His first films reflect a sense of late adolescent angst and rebellion against the older generation. The titles say it all. He wrote “Torment” (directed by Alf Sjöberg, 1944), and then wrote and directed “Crisis” (1945), “It Rains on Our Love” (1946), “Port of Call” (1948), “The Devil’s Wanton” (1948), and “Thirst” (1949). By the early 1950s, after three failed (of five) marriages and several liaisons, his films began dealing with the mysteries of love, loneliness and commitment. The director, like his protagonists, struggled throughout his life to establish lasting relationships with the women he loved. Bergman could not exorcise his religious background, however. In the early 1950s, while teaching theater at Malmö, he wrote a one-act play, “Wood Painting,” as an exercise for his acting class. It was based on the images he saw as a boy in a country church: devils, flagellants atoning for their sins and Death chopping down the tree of life. By 1955, this germ of an idea had blossomed into “The Seventh Seal,” the story of a knight, played by a very young and very blond Max Von Sydow, who returns from a Crusade, tormented by his loss of faith and awareness of his own mortality. The film established Bergman’s reputation in art houses and campuses around the world. It also began a series of seven films that explored the possibility of faith in a post-Holocaust, nuclear age. In “The Virgin Spring” (1960), “Through a Glass Darkly” (1961), “Winter Light” (1962) and “The Silence” (1963), he poses traditional faith questions in identifiably religious language. The characters struggle self-consciously with their inability to believe in God and form relationships with one another. In “Wild Strawberries” (1957) and “The Magician” (1958), the issues are veiled in layers of metaphor. The theological questions become apparent only by placing them in the context of the other films of the period. With “The Silence” he concludes that God is unknowable, and the human person must simply continue life’s journey seeking understanding and happiness however one can. At that point, God-questions drop out of his films altogether. Or do they? For the next 25 years, his self-centered and self-destructive heroes squirm in their own loneliness, unable to find salvation in human terms through their own efforts. In keeping with good Lutheran tradition, Bergman supplies redemption from without, inevitably in the form of a life-giving woman. He never coddles his audience with Hollywood happy endings, however. The hero can reject the woman’s advances as in “Scenes from a Marriage” (1981), or the God-surrogate can be destructive as in “Autumn Sonata” (1978), when the God-Mother (Ingrid Bergman) lacerates her daughter (Liv Ullmann) for failing to meet her expectations. The resolution can be complicated by multiple relationships as in “Fanny and Alexander” (1982), or it can be therapeutic as in “Persona” (1966). These later films of relationships can legitimately be read as a continuation in metaphorical terms of the theological questions he explored in his seven “God films.” In other words, I’m suggesting a unified rather than disjunctive reading of his work. The inherent unity of Bergman’s sense of alienation from both God and humanity appears most clearly in the dual narrative strands in “Winter Light.” One story rests squarely on theology. A Lutheran pastor in a remote rural area senses that he is losing his faith. His congregations are dwindling, he has little to say to those in need, and he finds the rituals “ridiculous.” The second story centers around his inability to accept human love offered to him by a parishioner, who remains devoted to him even after what appears to be the end of their previous involvement. She is a redeemer for him, but he rejects the food she offers, just as the congregations stop coming for the Eucharist he provides. Each story stands on its own, but each comments on the other, providing a different optic for viewing the pastor’s essential alienation. He longs to find some form of love in his life, but when it comes, he cannot recognize or accept it. In a terrifying final shot, he continues the Communion service before an empty church, as though resigned to continuing his search for meaning in the sparse light of a Scandinavian winter. During his “God period” Bergman worked endless variations on the first story. After he had banished God in “The Silence,” he turned his attention to the second. I’m suggesting something more than parallel narratives or interlocking themes in Bergman’s work—that is, a cohesive unity in his divine and human quests. The search for love in the later “post-God” works at the very least reflects the strong influence of his earlier theological concerns. Ingmar Bergman expresses the human search according to a religious template. But I would dare to go further: these troubled human relationships also reflect in metaphorical and poetic terms our contemporary, ongoing struggle to discover an authentic relationship to God. This article also appeared in print, under the headline "Ingmar Bergman, Theologian?," in the August 27, 2007 issue. Richard A. Blake, S.J., is professor of fine arts and co-director of the film studies program at Boston College in Chestnut Hill, Mass.